We usually view our glasses as half-full (or more!) When life gives us lemons (or boat fire, hurricane, stroke to name a few!) we've always made lemonade, playing the cards we've ben dealt the best we can. And honestly, we've had so many positive things come out of each of those awful situations. As long time meditators and yoga practitioners, we try to practice daily gratitude by either writing down, (or telling each other every night before bed) three things we are grateful for. The science behind a daily gratitude practice shows that it can actually boost your immune system, and help you sleep better. But that's not why we do it... we are truly grateful for SO many things in our lives, and all of you, our family, friends, and blog followers are included in our gratitude! April brought us something to be very grateful for. Heidi's Jackson Hole school classmate Shane and his wife Lybby graciously gave us a week of their time to help with some long overdue boat projects aboard Due West. Fellow boat owners themselves, they know all about working on boats and how squirrely boat projects can become. There always seems to be some hitch to every boat project, they never go quite as planned... So after Kirk's stroke, Shane contacted us to see if he could come down and help out with any boat projects. To quote from the Wind in the Willows, "...there is nothing - absolutely nothing - half so much worth doing as simply messing about in boats." Luckily for us, Shane loves "messing about in boats." And he had a bit of spare time between gigs as a National Geographic wildlife photographer (check out the snow leopard footage in DisneyNature's Born in China if you get the chance), and being a cameraman on Deadliest Catch. So we gratefully took Shane and Lybby up on their offer to come to paradise and help with some boat projects. Shane had been working on their boat in Alaska and had a layover in Seattle on his way to Mexico. So another gratitude goes out to our Seattle friend Pamela who ran around town picking up boat parts and specialty food items for us, and delivering them to Shane at SeaTac airport. 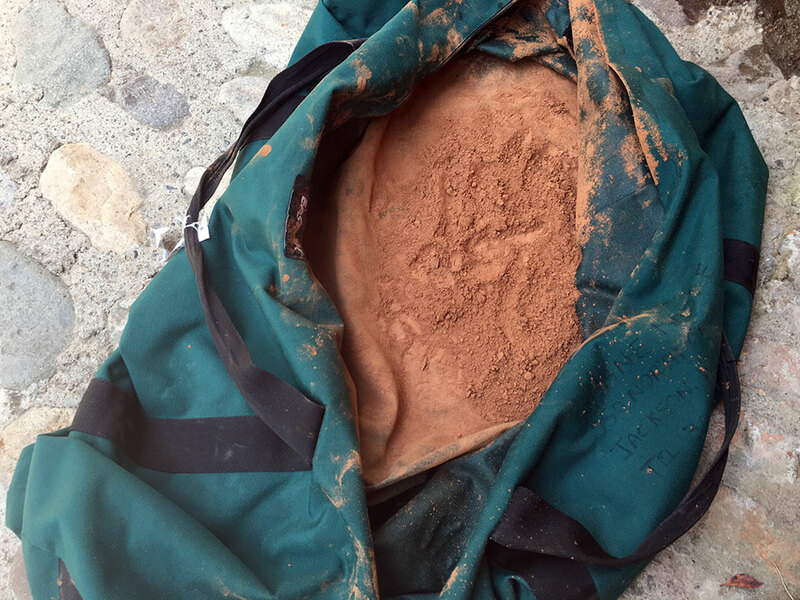 Sadly, TSA and Delta tossed their luggage around enough to break open one box of cocoa powder...Yikes! COCOA. POWDER. ALL. OVER. EVERYTHING!?! Captain Kirk had a long list of boat projects for Shane to help him with, and we quickly prioritized them into the top 5 most important. 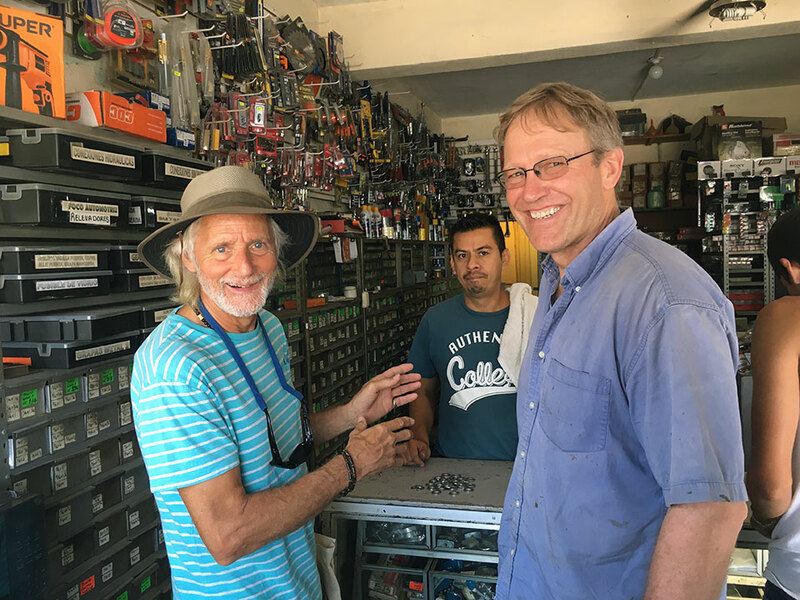 First stop, Tienda de Tornillos (the nuts and bolts shop) in Bucarias to find stainless steel washers to use as spacers on the chain plates. Back aboard Due West, Shane rebuilt the fresh-water foot pump at the head sink, which had sprung a leak. 1) Remove old sealant from beauty-plates around chainplate, and mask off deck. 2) Goop up hole and beauty-plate with 4200 sealant. 3) Clean off excess 4200 and pull masking tape off. 4) Ta-da! Newly re-beded (waterproof!) chainplates. THANK. YOU. SHANE!! 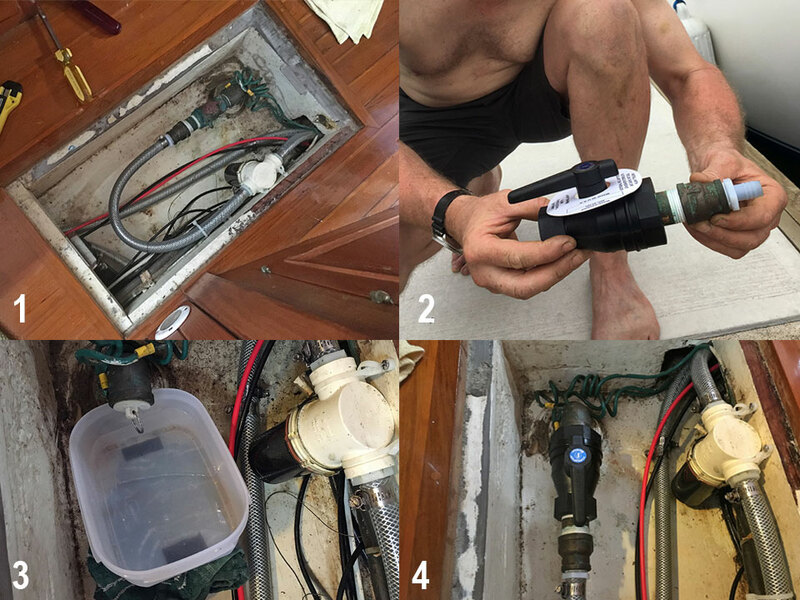 Next up: replace the saltwater through-hull valve for watermaker (desalinator). The through-hull itself was fine, but the handle on our old bronze valve broke-off in Kirk's hand last time he cleaned the watermaker and tried to re-open the valve. He had to use vice-grips and McGuiver it back open, then use rescue tape to stop the leak and still enable us to use the watermaker. NO BUENO! This was high on our list to repair, as we need to be able to close the valve and keep water out for safety reasons. This project also entailed hiring Diver Poncho to put a plug in the bottom of the boat while Shane and Kirk changed the valve inside the boat. We know this is the type of project that is BEST done when the boat is hauled out of the water... but that was not an option at this time. Luckily Plan B worked just fine. 1) Old bronze valve with missing handle. 2) New marlon plastic valve getting ready to be installed. 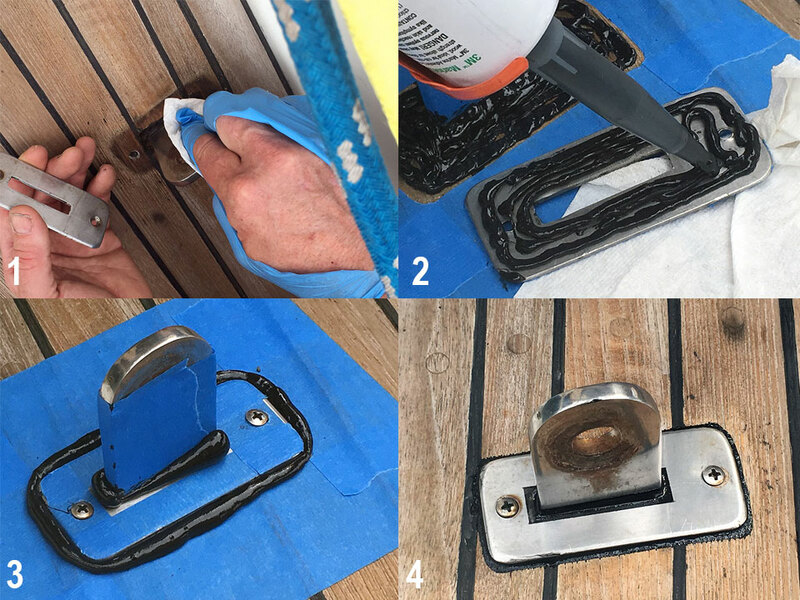 3) Sink-drain plug in the valve hole (tupperware tub to catch leaks) under floorboards while Diver Poncho tapped in a wooden plug from the bottom of the boat. 4) New valve in place and working great! THANKS Shane & Poncho! Meanwhile, Heidi decided to take advantage of being "stuck" in PV for a few months to finally get her 200 HR Yoga Teacher Training, something she'd wanted to do for many years but the timing was never right. 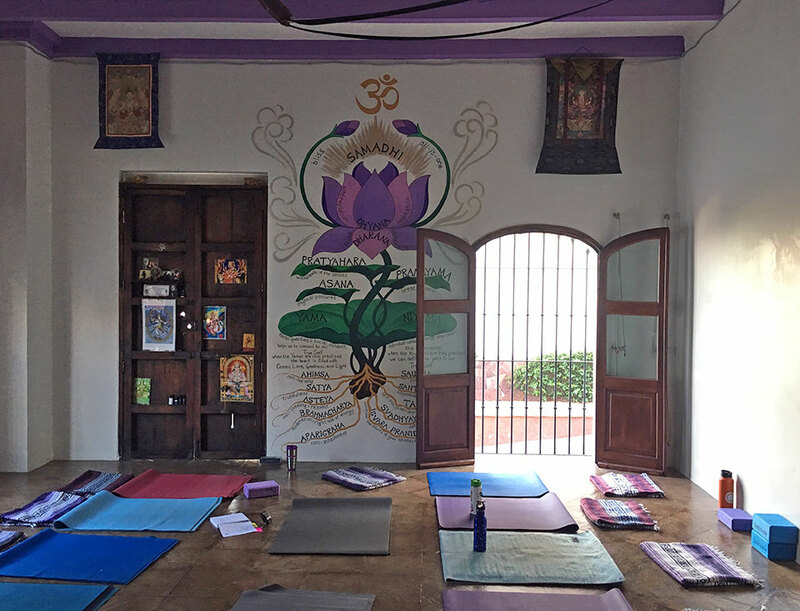 A series of interesting synchronicities lead Heidi to the front door of the lovely Davanna Yoga Shala, which was offering a 20-day/200 HR Intensive Teacher Training in May. Only one hitch, her yoga was kinda rusty as we hadn't been practicing yoga very regularly for the past 18-months (a little on deck, a little on the beach, a little on the dock!) And the Teacher Training would require taking 9+ yoga classes per week as part of the curriculum!?! Gulp! Luckily while Kirk and Shane worked on boat projects, Lybby was a great sport and went to several yoga classes with Heidi so she could knock some of the rust off her joints before the course started. All work and no play is no fun for anyone, even if working on boats in Mexico is much warmer than in Alaska! So we made sure Shane and Lybby had some FUN too. 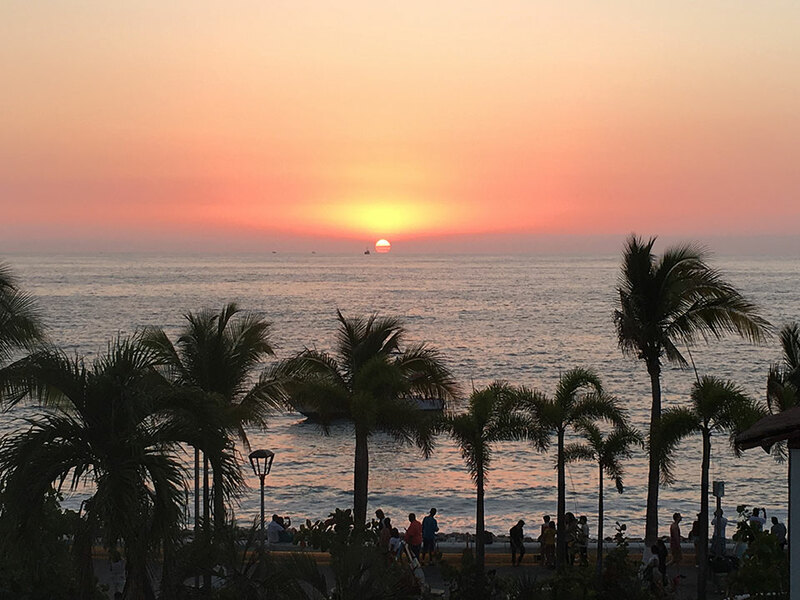 We checked out the Thursday night crafts market at Marina Vallarta, and the Saturday morning food market at Biblioteca Mangos, plus we ate some yummy meals out, and walked the Malecon and Old Town taking in PV night-life. To ensure we all got out on the water too (Kirk's FIRST time out on the water since his stroke!) 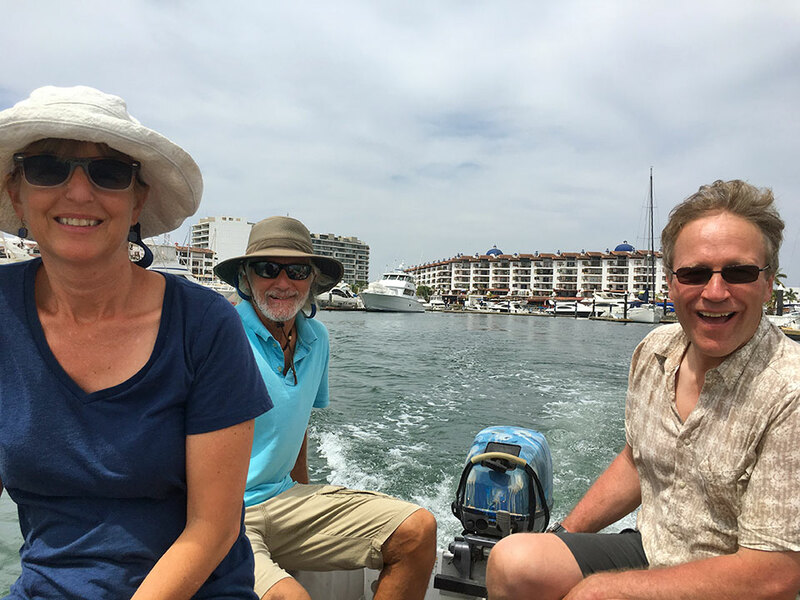 we took a FUN dinghy ride around Marina Vallarta and out into Banderas Bay before the guys stowed the dinghy and outboard away for hurricane season. All too soon it was time for Shane & Lybby to head back to their own boat. Growing up in land-locked Wyoming back in Jr. High who would have guessed that at least 4 kids in our class of about 100 would turn into sailors down the road?! Let alone be helping each other out on boat projects 40-years later...We are so GRATEFUL for Shane & Lybby's friendship and help! And we look forward to the day when we can all be out cruising together. They are contemplating crewing for our Panama Canal crossing next year which would be fantastic! 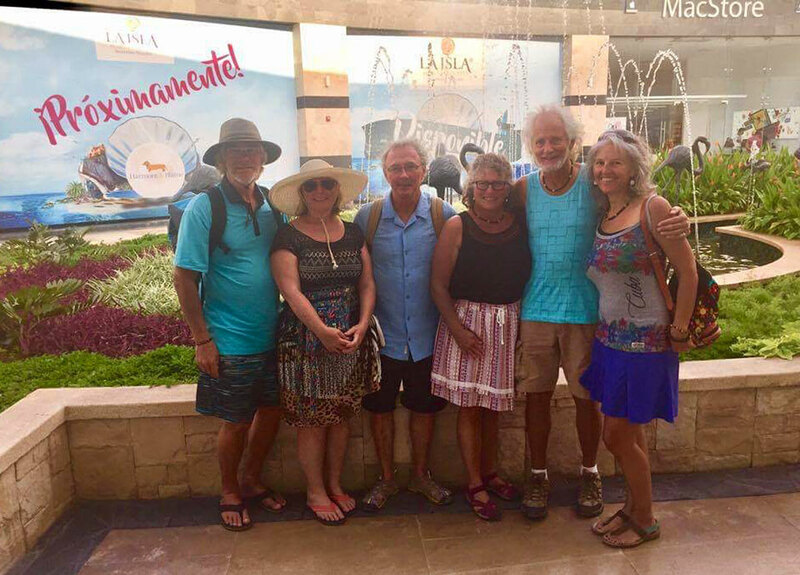 John, Boni, Stephen, Ginny, Captain Kirk and Heidi meet up in Puerto Vallarta. 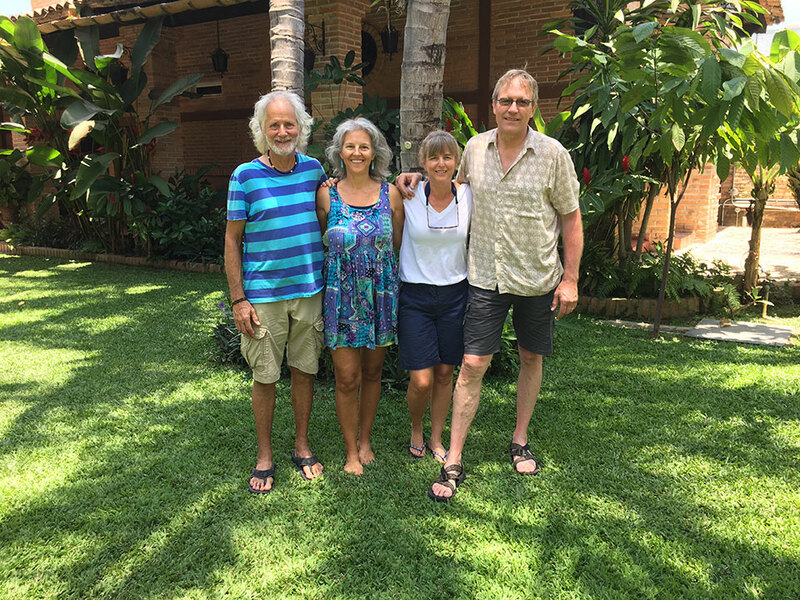 We were also sad to say bon-voyage to our cruising buddies John & Boni (s/v Ingenium) and Stephen & Ginny (s/v Jabaroo II) as they sailed north to the Gulfo de California (Sea of Cortez) for the summer hurricane season. We had originally planned to be sailing north with all of them again like we did last summer. 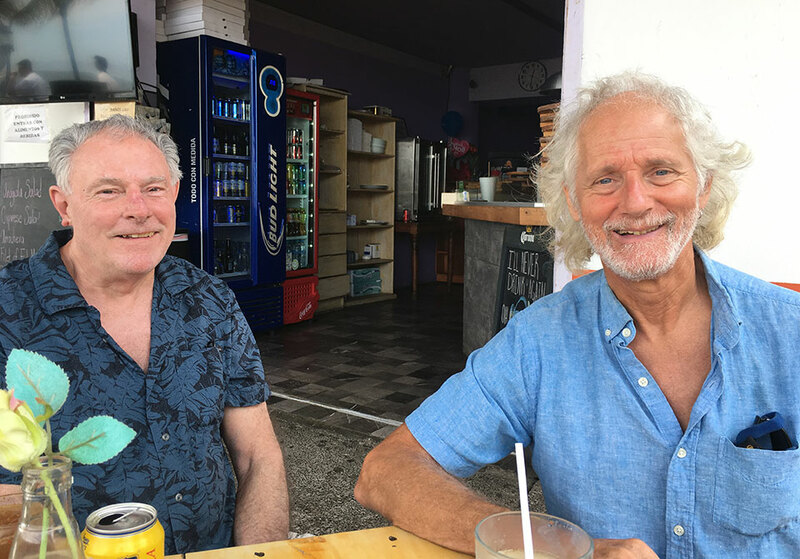 But after Kirk's stroke we decided to wait out Hurricane Season in Puerto Vallarta, so he could make a full recovery with good medical care nearby. We wish them fair winds and following seas, and are looking forward to seeing them back down this way next winter. 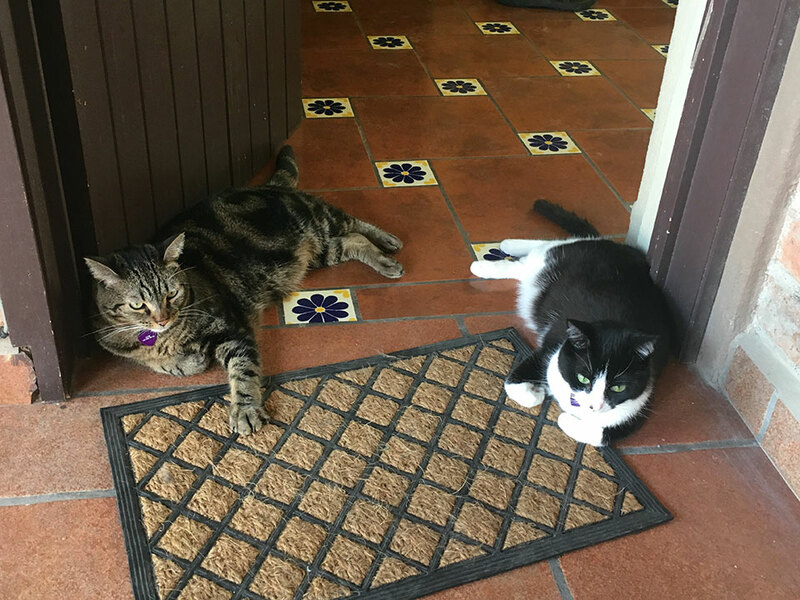 We MISS you guys and know you will have a FANTASTIC time up in the Sea. Say hi to the whale sharks for us!! One nice thing about Puerto Vallarta is that a LOT of our non-sailing friends tend to visit or snow-bird here! Kirk was really excited to meet up with his former colleague and mentor Roger, who first hired Kirk as a Landscape Architect and Environmental Designer in 1982 (the year emDue West/em was built!?) They worked together for over 10-years and Kirk still considers Roger to be one of his closest friends. Roger and his wife Kay live in PV part of the year, and it was fun to reconnect with them before they headed back to Seattle for the summer...lots of old stories to share. With most of our friends gone, it was time for Heidi's 200 HR Yoga Teacher Training class to start. It ran every day from May 1-20, phew! Kirk and the Furbies were such troopers keeping our home-life on track as Heidi was out the door at 06:45 every morning, and some nights not home until 2100 or 2200 hours, with homework still to be done. Since she had to take every public class at the studio (9 per week) as part of her training, Kirk was able to join her for a few classes a week which was fun. 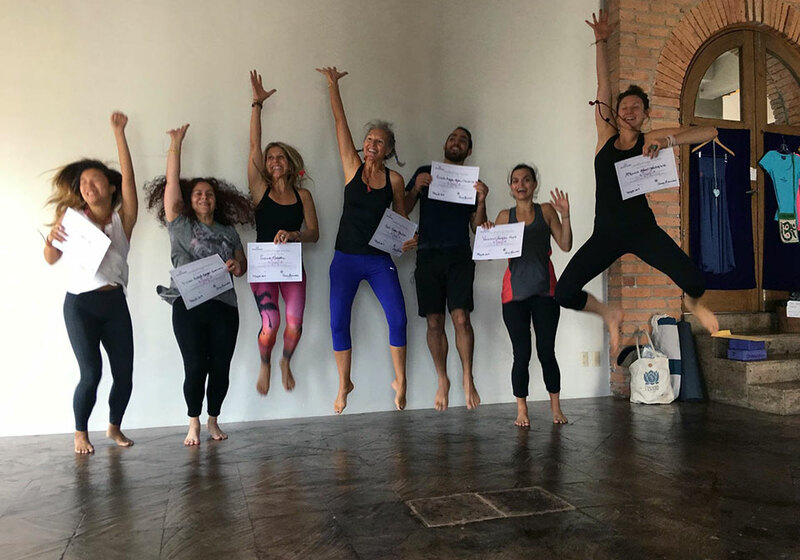 He even got to take her final-exam class where she taught a public Restorative Yoga class along with her class mates Susan and Vivian. Three weeks flew by and before we knew it 200 hours had passed and the class of 7 students from around the globe had graduated! Wahoo!! Heidi's yoga classmate Vivy, from Hong Kong, stayed with us for a few days after yoga training was over and we so much enjoyed her smiley personality. Tosh and Tikka were especially taken with Vivy who doted so much attention on them. When she packed her bags to leave the were very sad, and tried to hide in her luggage to head back to Hong Kong with her! That would have made us very sad. Making new friends from around the globe is one of the biggest perks of being a cruiser (or yogini! :-) but it's always sad to say bon voyage. 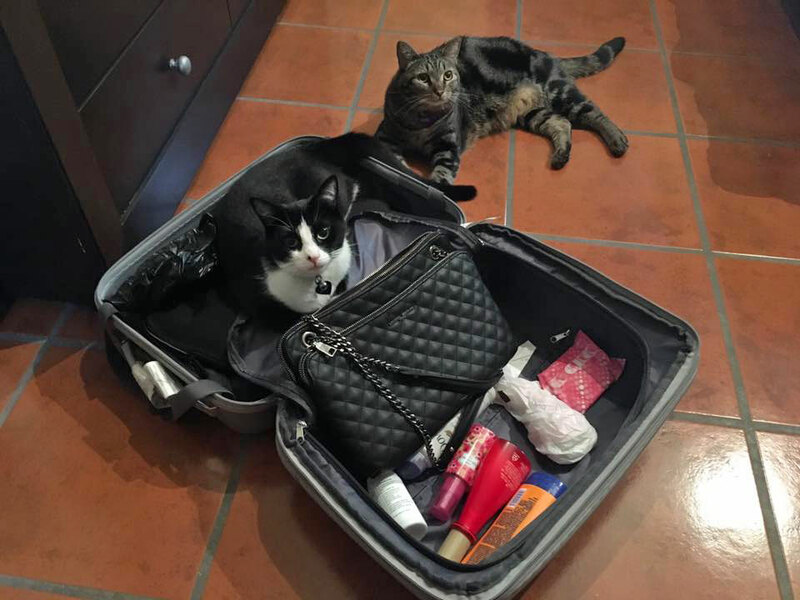 Tikka & Tosh contemplated stowing away in Vivy's luggage back to Hong Kong... luckily in the end they decided to stay with us! It's been three months since Kirk's stroke, and his recovery is going very well. He's now practicing yoga 3-4 times a week. Some days he still gets light-headed and has to take it easy. He's still taking 2-hr. naps every afternoon which help with the light-headedness. And he's still diligently doing his Physical Therapy weight lifting, balancing, stretching, abs, and walking about 4-6 miles a day! Heidi is SO impressed. Overall he is doing great, but still has some weakness and numbness in his right arm and right pinky and ring finger, and random lightheadedness. It's all part of the evolution to re-program the brain, and thankfully he's better and better each week. A BIG THANKS to all of our friends and family who continue to make donations towards Kirk's medical costs. We have passed the half-way mark to our goal!! We are SO grateful for everyone's love and support. Here's the link if you'd like to make a donation. Next week we'll be moving out of this lovely 60-year old Mexican hacienda we've been staying in for the past three months. More gratitudes to Leslie & Dean for allowing us to stay so long. You guys have been the BEST land lords and friends ever! And to Mike and Emily for hooking us up with this great place. Now on to our next gig condo-sitting for our friends Judy & Paul in their lovely condo on the beach, while they head back to Seattle for the summer. It's a tough job, but somebody's gotta do it! We'll hold down the fort and watch the storms roll by the bay. We'll only be a few miles away form Due West, snugged tight in Marina Vallarta, and will be checking on her often and continuing to work on boat projects throughout the summer, getting her ready to continue south next winter. LOVE and Gratitude for all of you...have a happy Memorial Day weekend! Remember to check out more photos from this post in our Photo Gallery.